When you select a physical device (for example, Hard Disk 0), the wipe command processes all logical drives consecutively, deleting data in unoccupied areas. Unallocated space is not touched. 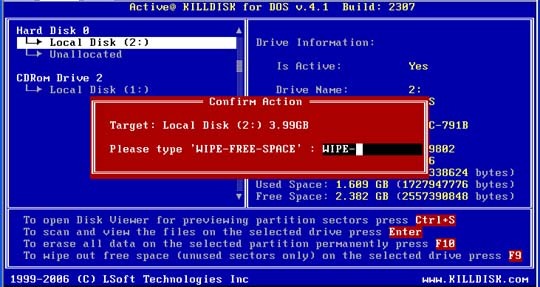 If KillDisk detects that a partition has been damaged or that it is not safe to proceed, KillDisk does not wipe data in that area. It does not proceed in case it is a damaged partition with important data. If you want to erase data from the hard drive device permanently, see 3.3.1.1 Erasing the Data. If you want to wipe data in unoccupied areas on selected logical drives, follow the steps in 3.4 Erasing and Wiping Logical Drives. When you have selected the device to wipe, move the cursor to that device. To wipe all data in unoccupied sectors on the selected partition, press [F9]. The Wipe Method screen appears. To select a different wipe method, press [Enter]. Wipe methods are described in Chapter 6 of this guide. Use the keyboard arrow keys to select the wipe method that you want to use. Press [Enter] to use the selected method. After parameters have been set, move the cursor down to CONFIRM AND WIPE. This is the final step before wiping data residue from unoccupied space on the selected drive. After the process has started, you may stop it by pressing the [Esc] key. Type WIPE-FREE-SPACE and press [Enter]. Progress of the wiping procedure will be monitored in the Disk Wiping screen. To stop the process for any reason, press the [Esc] key. Please note that all existing applications and data will not be touched, however, data that has been wiped from unoccupied sectors will not be recoverable. There is nothing more to do until the end of the disk erasing process. The application operates on its own without user intervention. If there are any errors, for example due to bad clusters, they will be reported on the Interactive screen. If such a message appears, you may cancel the operation (by pressing [Esc]), or you may continue wiping data. After the wiping process is completed, to inspect the work that has been done, select the wiped partition and press [Enter]. KillDisk scans the MFT records or the root records of the partition. The Files Preview screen appears. Existing file names and folder names appear in white colour and deleted file names and folder names appear in gray colour. If the wiping process completed correctly, the data residue in these deleted file clusters and the place these files hold in the root records or MFT records has been removed and you should not see any gray-coloured file names or folder names in the wiped partition.